Aimee has been a REALTOR® in Meridian since 2013 and she works hard to provide exceptional customer service and great attention to detail for all her clients. 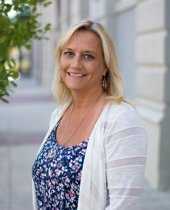 Aimee was relocated to this area from Washington State with her husband of 32 years because of his work and she knows first hand the ins and outs of Relocation Real Estate. She continues to focus on that area of our industry and works diligently on behalf of her clients to make the relocation process as smooth as possible even as she branches out into other areas of expertise. She genuinely loves the Real Estate business and looks forward to assisting you with all your Real Estate needs.